Here is a post from the personal blog of the cm5’s Jim Ivy. He has an ambitious project for the In-Between Series (curated by the cm5’s Pat Greene) at the Gallery at Avalon Island. Check it. A quick word to help promote the upcoming show: May 18 at 7pm at The Gallery at Avalon Island. 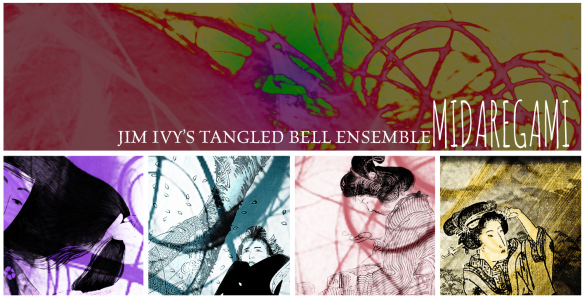 The In-Between Series presents Jim Ivy’s Tangled Bell Ensemble performing Midaregami. The main goal of this exploration is to juxtapose seemingly conflicting concepts and approaches, and display them in an aligning way; to show how antagonistic forces and unfamiliarity can create a cooperative friction and become formidable allies. The intent being that all portions of the whole (notated music, text, improvisation) were at once independent of and mutually dependent upon each other; symbiotic. Each being a part and apart simultaneously.